Last week, I started the series, Identifying Your Photographs. I hadn't meant to do two in a row, but I can't seem to finish the other stories that I'm working on. 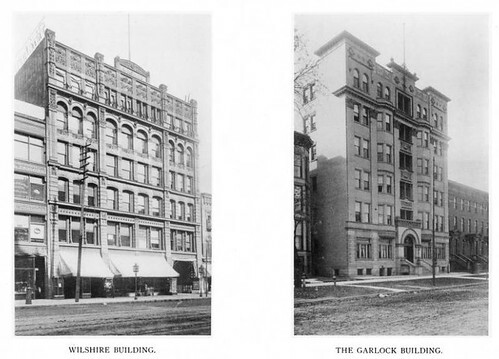 A reader asked me about these two buildings, which were both pictured in the 1889 edition of Cleveland Illustrated. His inquiry involved not merely their address, but their exact location on the block. I checked the usual sources, which, these days tend toward architectural magazines in the public domain available through Google Books. I checked the Cleveland Memory Project. The Cleveland Architects Database was a bit helpful. 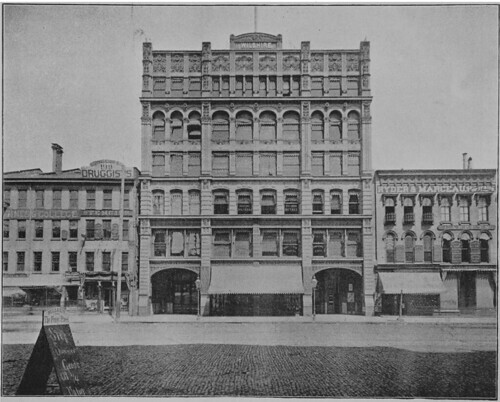 It revealed that the Wilshire Building was built in 1881, on Superior Avenue, and was designed by architect John Edelmann. 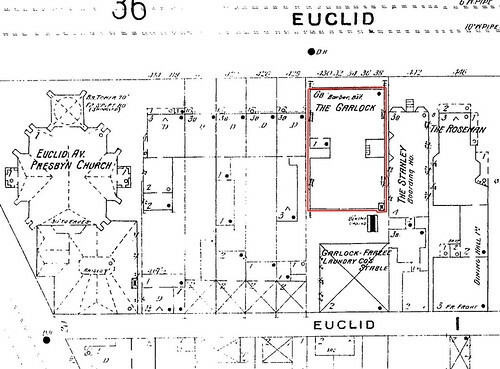 I also learned that the Garlock Building was built in 1894, and was located at 1602 Euclid Avenue. The architects were French and Chapman. It's worth noting that the search, as set up for the Cleveland Architects Database tends to be limited to just the names of the architects. If you're searching for a building, one can get better results using Google search and limiting it to the web site in question, for instance, in this case, "wilshire site:http://planning.city.cleveland.oh.us/landmark/arch/", was the search that led me to the information about the Wilshire Building. I still didn't have firm locations for these structures. This led me to the Sanborn Fire Insurance Maps for Ohio. This database is available to anyone with a library card in Ohio. The database often includes the names of buildings, and in this case, I found both of them. This is a detail from an 1896 Sanborn map. 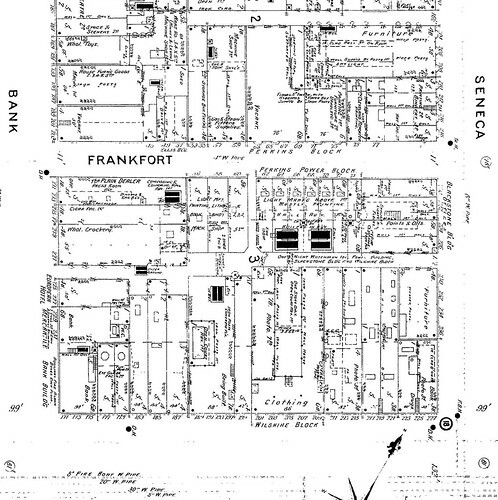 It shows the area bounded by Bank Street (now West 6th) on the west, Frankfort Avenue on the north, Seneca on the east (now West 3rd Street), and Superior Avenue on the south. Just off-center, at the bottom, is the Wilshire Block. How do we know that this is the building that we are looking for, and not another structure with the same name? (This is not uncommon.) This detail helps illustrate the building a bit better. 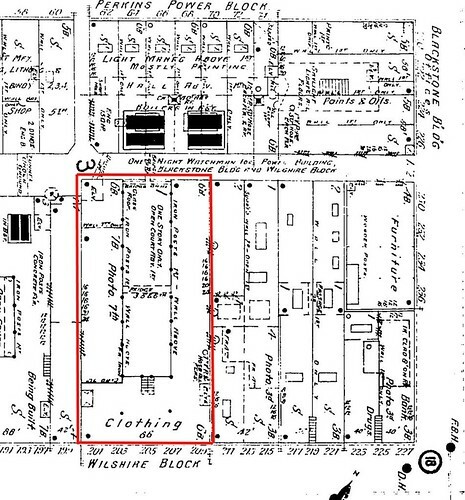 The Wilshire Block is outlined in red. In the lower right corner, you can see the notation "6B" - this indicates that the building is six stories high and constructed from brick. In the building to the right, a notation in the corresponding corner indicates it is three stories and also brick. One can almost make out a "4" in the building to the left, on this map. These correspond exactly to the buildings shown in the photograph. We might also note that while the first floor occupies the entire footprint of the structure, the map shows that remaining floors opened onto an atrium. While working on this, I stumbled across another illustration of the Wilshire Block, in Cleveland Illustrated, page 32. (Consolidated Illustrating Co., Cleveland, 1893) Provided courtesy of Cleveland Public Library. It illustrates an ornate and imposing commercial structure. The name "Wilshire" can be seen clearly at the top, centered. None of the buildings pictured here remain - instead, there is just parking. Now, for the Garlock building. This detail, also from an 1896 Sanborn map, shows the area bounded by Euclid Avenue on the north, East 18th Street on the east, Prospect Avenue on the south, and East 14th Street on the west. "The Garlock" can be seen just to the left of center, at the top, on Euclid Avenue. This detail, with the Garlock building outlined in red, helps us acertain that the structure is, in fact, the one we are looking for. Note, based on the same information we have above, that this is a six story building, with three story structures flanking it on either side. It shows a building set forward from the rest of the block, just as it is in the photo. Do you have a photograph that you would like to have researched and included in this series? 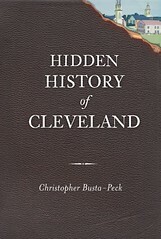 Get the best quality scan that you can still email - note that the crucial information here was pulled from tiny details - and send it to ClevelandAreaHistory@gmail.com. If you don't have access to a scanner, you can mail me your original photograph, well-protected and at your own risk, with a self-addressed stamped envelope for its return, and I'll scan it. I look forward to identifying your Cleveland area photographic mysteries. These were both beautiful buildings as were their flanking structures. All kinds of questions arise, such as build/demo dates and functions. Am drawn to The Garlock and adjacent buildings on Euclid at E 18th. They all look to have been fashionable residences of the row house type. According to the 1896 map, immediately east stood The Stanley (boarding house) and The Roseman, also residential. 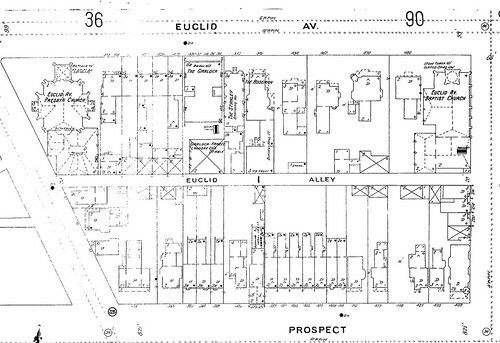 Immediately west was a set of brick row houses, of the type now preserved only on Prospect, at E 36th. We forget that, before automobiles, Cleveland had a great range of downtown living options. In the efforts to revive downtown living, photographs of these handsome early structures might help catch attention. Exactly How Old is That House?